The story of Eileen Ryan is not mine to tell. She is a grand-aunt of my wife Roma and I am not related to her (though I am concious that my three daughters are her great-grand-nieces). 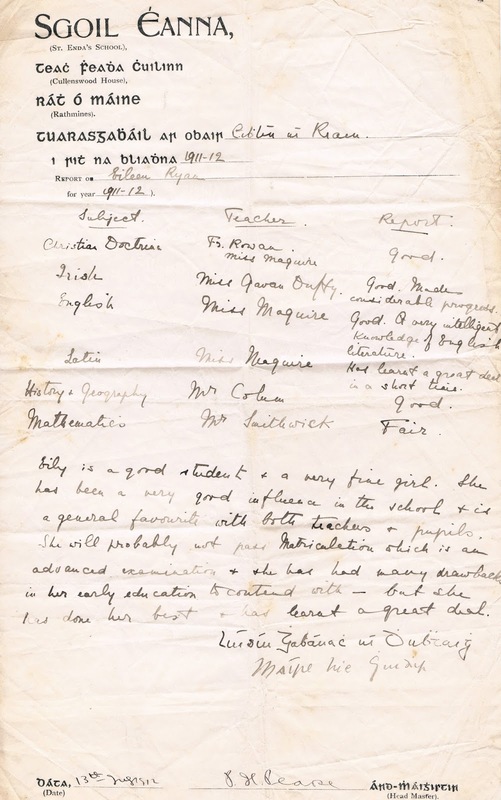 The collection of documents that are contained in the Eileen Ryan Collection have been reviewed by a specialist in Pearse family memorabilia, and an auctioneer specializing in 1916 memorabilia. 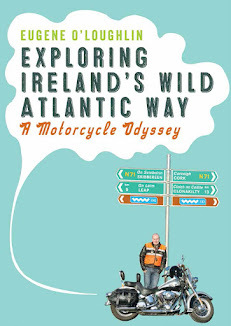 Both found the collection interesting for its curiosity rather than value - a Mayo historian specializing in local women who were involved in Irish Independence had never heard of her. The Collection also contains private letters that with one exception, a letter to Eileen from Margaret Pearse (Patrick and Willie's mother), have no historical value. I'll not publish these letters here - I'll leave it to my in-laws and daughters to decide what to do with them. One interesting document about Eileen Ryan that I can publish is a school report for her for the 1911/1912 academic year - she was a boarder at St Ita's Girl's School on Oakley Road in Ranelagh. This school was a partner of the better known St Enda's School for boys in Rathfarnham - both were run by the Pearse brothers and their family. 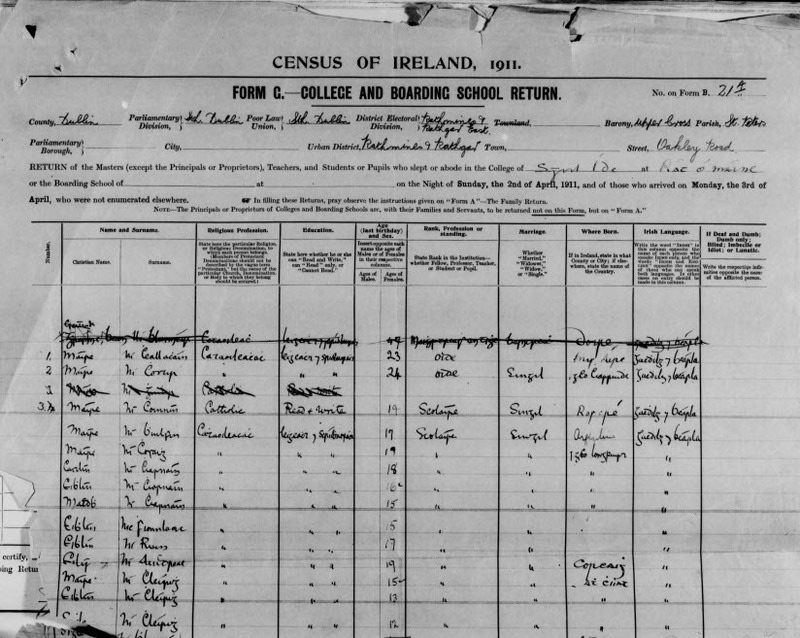 The school clearly had very few boarders - on census night in 1911 there were 11 girls listed (all names in Irish) - including the then 17 year old Eibhlín Ní Riain. Details from the 1911 Census return form are also shown below. In her school report, Eileen is described as a "very fine girl" and a "favourite" of teachers and other girls. The report lists her subjects as mostly "Good" with Mathematics just "Fair". 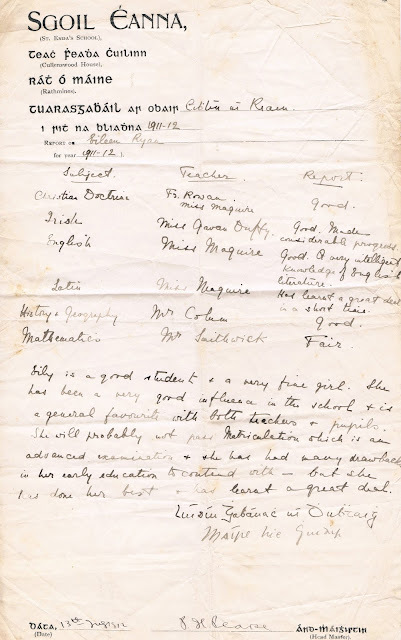 One of her teachers was nationalist (and suffragette) Louise Gavin Duffy - her brother George Gavin Duffy was later a reluctant signatory of the Anglo-Irish Treaty in December 1921. Interestingly, LGD predicts that Eileen will not "pass Matriculation" - then an exam for entry to University. The report is printed on St Enda's School notepaper - possibly because the cost of printing extra report papers for St Ita's could not be met by the always cash-strapped schools. The report is signed at the end by Patrick Pearse, the Head Master of both schools. Screen capture from 1911 Census.